Belgian newcomer Ine Neefs possesses the kind of effortless pristine beauty that had industry insiders asking in unison, "Who's that girl?" when she debuted exclusively at Jil Sander during the Spring/Summer 2014 season. Neefs' delicate features and 180 cm silhouette blitzed an ultra-blue chip trail throughout her appearances at Balenciaga, Christian Dior, Chloé, Valentino, Chanel, and Céline. With dreamy baby blues, a glowing peaches and cream complexion, and an elegant runway composure, Neefs has been omnipresent in the minds of casting directors, fashion editors, and designers since her remarkable debut. The buzz surrounding Neefs is warranted given her ensuing Spring/Summer 2014 campaign berths for Valentino and McQ lensed respectively by Craig McDean and Steven Klein, in addition to a show list of epic proportions at the recent Fall/Winter 2014 season. Opening or closing for five Fall/Winter 2014 shows in total including Calvin Klein, Jil Sander, and Valentino, Neefs found herself in the rarefied position of being the muse most sought after by influential fashion houses. Eighteen year old Neefs' runaway success is a testament to the importance of timing in the ever-fickle world of fashion. Discovered two years ago while shopping in Antwerp, Neefs put modelling plans on hold until she felt ready to commit to modelling full-time in early 2013. The wait clearly paid dividends with the elusive and exclusive Neefs commanding and holding the attention of fashion denizens with her ethereal beauty. Represented by a formidable group of agencies including Dominique Models, DNA in New York, Elite Model Management Paris, and Premier London, Neefs' Fall/Winter 2014 campaign and editorial options will no doubt be kept in sync with her current stunning modelling trajectory. Neefs took time out from her frenetic post-Fashion Week schedule to chat exclusively to IMA about her stratospheric rise through industry ranks, her relaxed approach to modelling, the importance of maintaining a little mystery in the current social media crazed age, and her basic wardrobe essentials with the odd Céline bag thrown in for good measure. Inoubliable Model Army (IMA): Hi Ine, thank you for taking time to chat with IMA. Congratulations on a stunning Fall/Winter 2014 show season! How are you feeling now that you have had a moment to catch your breath following Fashion Week? IMA: As a newly relaunched face, would you mind sharing your backstory with IMA? IN: No problem, I'm 18 years old and come from a small town in Belgium called Wuustwetzel. I was discovered while shopping in Antwerp. I was initially scouted two years ago then stopped modelling for a while because I was not quite ready. But my agency insisted on me giving modelling another shot a year ago and that's what I did. 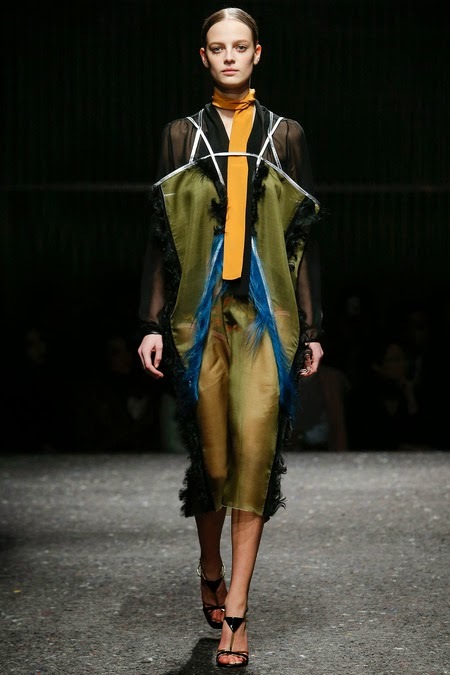 IMA: You initially signed with your mother agency Dominique Models in Belgium and took a break before reemerging at the Spring/Summer 2014 collections. What prompted the break and now age 18, do you feel better equipped to handle the pressures and demands of full-time modelling? IN: I feel better equipped now but I'm essentially still that girl from a small town who is not used to being in the spotlight. It can be a lot of pressure and sometimes it is just good to be able to return home. IMA: You've had a dream run so far debuting during the Spring/Summer 2014 season in Milan as a Jil Sander exclusive before walking for Christian Dior, Balenciaga, Chloé, Alexander McQueen, and Chanel. At the Fall/Winter 2014 collections you logged 25 show bookings opening for Jil Sander, Iceberg, and Missoni, and closing for Calvin Klein and Valentino! Were you shocked by the number of shows that you opened/closed and what have been some of your favourite runway moments so far? IN: No, not really ;-). As I mentioned, I come from a small town and was never really interested in glamour and the fashion world. So I was not shocked as it has never been a goal of mine. I try to take things as they go. IMA: Tell us a little about your hometown and your childhood. Has it been a challenge to be away from home so often due to your modelling obligations and are there any immediate plans to relocate to New York? IN: I had a great childhood. I live in a town where everybody knows everybody. Everyone on my street went on holidays together and it was so much fun. It is still a challenge to be far away from home but it's also part of the job. I'm not sure if I would relocate to New York as I would miss my family and friends so much but you never know what the future may hold. IMA: Beauty is only part of a model's overall package. What other personal qualities do you feel are important for a model to succeed at the elite level? IN: To be honest, to always be yourself, and to take care of your lifestyle! IMA: IMA hears that you have a keen interest in photography. What style of photos interest you most and are there any photographers whose images you are particularly inspired by? IMA: You displayed incredible versatility in a variety of designs this season. Was there an outfit that you wore this past season that you felt like a millions dollars in. How would you describe you own sense of style and what are your current wardrobe essentials? IN: All of the Valentino outfits! They make you feel so special and amazing, but every designer and outfit has a story that makes you feel a certain way. I have a very basic sense of style. My wardrobe essentials are jeans, a tank top, All-stars and a nice pair of derbies ;-). A bag is very important too! I love my Céline and Michael Kors bags. IMA: The latest issue of American Vogue reports on the rise of a new breed of top models whose use of social media has enabled them to reach a demographic beyond the world of fashion. Are you active on Instagram, Facebook, and Twitter, and do you feel that social networking tools detract from the mystery that is also a big part of a model's allure? IN: Yes, I'm active on social media but mainly with people I know. And yes, I think the mystery disappears but I guess this is just part of the way this new age century works. IMA: You are represented by a formidable group of agencies including Dominique Model Management, DNA Models, Elite Model Management Paris, and Premier Models. How did you mother agency Dominique prepare you for the rigours of Fashion Week and what has been the most valuable advice that your agents have imparted to you? IN: Dominique Models were honest with me and were there to help me cope with all of the new things that were going on. The best advice was that my agency said that modelling is a real job where it's important to be professional and friendly with the teams that you work with. And as it is a job on its own, there are great moments but also stressful ones. 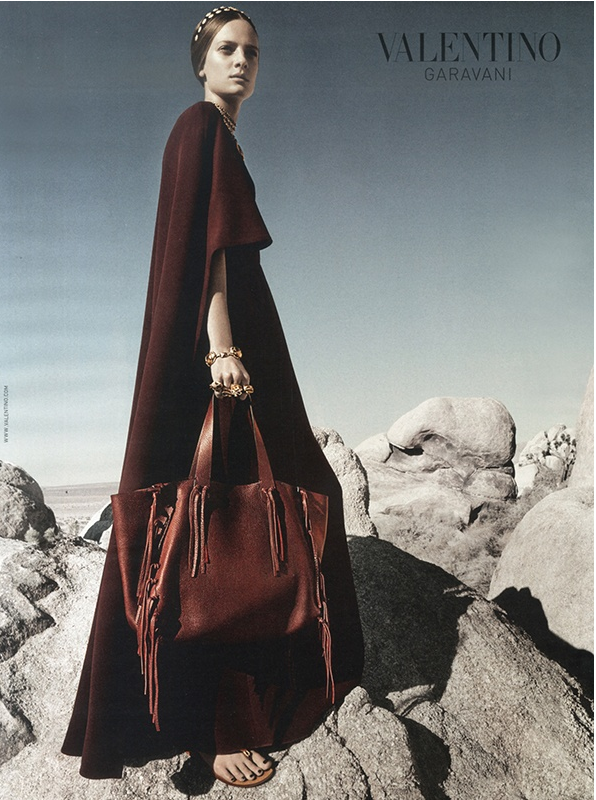 IMA: Your appearances in British Vogue and Valentino's Spring/Sumer 2014 campaign have everyone talking. Do you enjoy the print component of modelling and has your interest in photography helped you to develop an understanding of the unique relationship between a photographer, the camera's lens, and the model? IN: I always wanted to study photography but haven't had the chance to so my interest hasn't really helped me with my understanding. Experience and advice helped me with this. And it's still weird to see myself in magazines! IMA: What do you hope to achieve in modelling and what career path would you have considered had modelling not intervened? IN: I tend to go with the flow and to live life as it is. I don't want to suggest any goals as everything at the moment is going great. If I wasn't modelling I would be studying to be a kindergarten teacher! IN: I really can't answer that question! I have no idea. I only hope that the important people in my life think that I am "Inoubliable" to them through the way I am.